On the surface, Strictly Reptiles of Hollywood, Florida is the world's largest reptile import-export company, legally selling hundreds of thousands of snakes, spiders, and other creepy crawlies each year, and the likely source behind the green iguana or turtle in your local pet store. But to Special Agent Chip Bepler of the U.S. Fish and Wildlife Service, owner Mike Van Nostrand and his father are the brains and bank behind a vast global wildlife smuggling network. 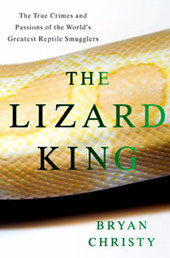 In his non-fiction book, THE LIZARD KING, author Bryan Christy takes readers on a wild ride into a criminal jungle extending from South Florida through Europe, terminating in Southeast Asian mastermind Anson Wong, "the Pablo Escobar of wildlife trafficking," who uses cheap reptiles as a front to traffic the world's most precious animals, including rhinos, pandas, and snow leopards. THE LIZARD KING is the true story of crafty smugglers supplying rare animals to collectors and zoo curators worldwide; it is the story of an amazing multi-million dollar industry in genetically-designed snakes selling for $100,000; and it is a story of obsession. ...And not just the bad guys'. In researching this book, Christy was bitten between the eyes by a blood python, chased by a mother alligator, sprayed by a bird-eating tarantula, and ejaculated on by a Bengal tiger. Thank you for visiting this site dedicated to The Lizard King book. For more, and latest on Bryan Christy’s work, please visit www.bryanchristy.com. Here’s my take on the Florida Python Hunt, running in National Geographic. The case against the states wildly popular python hunt. For all this theAtlantic.com calls me Lisa Simpson. Now, if only I could get a call to do a voice on the Simpsons. Moe, a beeuh Moe. I’m dying over heah.